For those of us in the Harry Potter generation, Lemony Snicket’s A Series of Unfortunate Events was like the star jock’s quirky younger sibling. It featured solid suspense and plenty of heartrending moments, but it was too clever and meta-fictitious to find more than a niche audience. Snicket (real name Daniel Handler) is perhaps the series’ best character, and his writing feels as if The New Yorker and Clickhole have teamed up to imitate Roald Dahl. So when Netflix announced its adaptation of the series, my main question was: Is A Series of Unfortunate Events adaptable to the screen without losing the idiosyncrasies that make it so charming? There had been one previous attempt—a 2004 film starring Jim Carrey, Billy Connolly and Meryl Streep (! )—but while Carrey shone as Carrey and the visuals stood out, the movie lacked the books’ spirit, and planned sequels never materialized. But executive producers Barry Sonnenfeld and Handler, along with star Neil Patrick Harris, have proven my suspicions wrong. A Series of Unfortunate Events, which begins with eight episodes of a planned 26-episode series, doesn’t hit the emotional heights of Netflix’s best fare. But the streaming giant has on its hands a new series that abounds with wit and solid acting, feels like nothing else currently on television, and more or less lives up to the source material. It should be a delight for book-readers and newcomers alike. Signing Harris to play the villainous Count Olaf was a huge coup in terms of marketability, and it paid off: Harris nails a role I previously thought damn near impossible to nail. Olaf, an awful actor/master of disguise/criminal whose scheming for the three Baudelaire orphans’ massive fortune comprises the series’ main plot, lies somewhere in between a buffoonish cartoon and a terrifying, murderous psychopath. When Carrey played the part, his natural screwball comedy instincts skewed his performance toward the former, which significantly decreased the film’s stakes and suspense. Harris, however, manages to believably oscillate from one extreme to the other. In a ten-minute span of the series premiere, “The Bad Beginning – Part 1,” for example, his Olaf sings a nonsensical, funny song with the sycophantic members of his acting troupe, then commits a number of brutally violent acts against the Baudelaires, who are at that point under his guardianship. James Newton Howard’s whimsical but foreboding score plays a key role in the volatile transitions, but it’s Harris’ versatile acting chops doing most of the heavy lifting. His performance in the third episode, “The Reptile Room – Part 1,” where Olaf is disguised as an assistant herpetologist named Stefano, helps it stand out as the best of the first batch. One of my major worries coming into the series was the way the Lemony Snicket character would be handled. The books would be half as long and less than half as interesting without their author’s winding, winking commentary. But Patrick Warburton’s deadpan narrative intrusions as Snicket add a great deal of wry humor and prove crucial to the series’ style. The decision to have him wander around freeze frames (or, in some cases, step into the foreground with action still proceeding behind him) gives the show the feel of a diorama, as if the events within are contained in a row of boxes we can view on a guided gallery tour. Such a surreal vibe helps maintain a critical distance between the audience and the show, without which much less about this series would be funny—you’d just have a story about three orphans placed in crisis after crisis, which would make for a rather generic bildungsroman. Instead, Sonnenfeld applies his typical strangeness and comes up with a product that resembles a delightful cross between Tim Burton’s gothic tales and the dollhouse architecture of Wes Anderson’s more recent works. One of the strongest visual aspects of the series is the decision to clothe the Baudelaire children in bright colored clothes against drab, dark backgrounds—particularly in “A Bad Beginning” and “The Wide Window” (episodes 1-2 and 5-6, respectively)—creating a stark contrast between the grimly perseverant protagonists and the circumstances that threaten their lives and their spirits. I can only assume that as the tone of the series darkens (and it does, as the story proceeds), their wardrobe will darken as well. 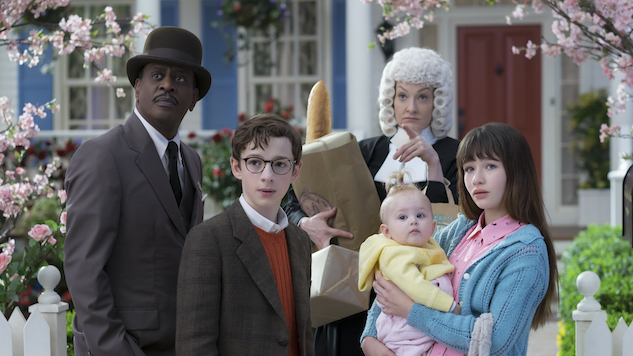 The only significant issue with the disconnect between the viewer and the characters is that, at times, A Series of Unfortunate Events feels emotionally insincere or, worse, as if it hasn’t earned its emotional moments. Some of that comes with the territory of maintaining a menagerie of colorful characters—headlined by K. Todd Freeman as the moronic banker Mr. Poe, who gets funnier and funnier with each episode—who still require human moments. While Joan Cusack’s kindly, lonely Justice Strauss pulls this off, Alfre Woodard’s unconvincingly skittish Aunt Josephine does not. Interestingly, the episodes written by Handler himself perform this high-wire act measurably most successfully; the other writers capture either the series’ patent absurdism or its heart, but not both. Some of the series’ emotion issues also fall upon its child stars, Malina Weissman and Louis Hynes, who rise to an admittedly daunting challenge with solid but inconsistent performances as Violet and Klaus Baudelaire. At their best, particularly in the sixth episode, “The Wide Window – Part 2,” the young protagonists temper the utter despair of their situation with a steely determination and a realistic sibling dynamic. (Hynes reminds me, in looks and demeanor, of a younger version of Zombieland-era Jesse Eisenberg.) But Weissman and Hynes have trouble following the rapid vacillation between comedic Count Olaf and menacing Count Olaf, which can throw the series’ finely calibrated tone off balance, and, especially in the two installments of “The Miserable Mill” (the final pair of episodes), their performances feel wooden and lack the necessary gravity. Then again, the blame might more fairly be placed upon the fact that the story needs room to grow. It should be obvious, but the first eight episodes of a 26-episode series with “unfortunate events” in the title should not constitute the peak of desperation. On that note, it’s probably best that Sonnenfeld and Handler expended the majority of their creative energy on creating the show’s wonderful, absurdist world before filling it with increasing misery and woe. And, as far as beginnings go, Season One of A Series of Unfortunate Events easily trumps Chris Columbus’ clunky, stifling contributions to the Harry Potter filmography. Netflix’s A Series of Unfortunate Events debuts Friday, January 13. Zach Blumenfeld recently relived his childhood by re-reading all 13 books in A Series of Unfortunate Events and tried really, really hard not to be a book snob in this review. Follow him on Twitter.